When a layer of ice forms over the surface of you water garden, it essentially eliminates any transfer of air to or from your pond’s water. What this means to you is that, as debris decompose and your fish consume oxygen, byproducts are produced in the form of gasses that are toxic to your pond’s inhabitants. These gases are trapped under the ice and cannot escape; fresh air from outside the pond cannot reach the water either and so begins the process of the winter fish kill. Keeping a hole in the ice will allow the bad air in the pond to be replenished with good air. Those of us that are in colder climates can add to our enjoyment of our koi or goldfish pond by using a pond heater in the winter months. A pond heater will also help to keep your koi and goldfish healthier during the winter. There are several options when it comes to choosing a pond heater. An electric pond heater can offer more versatility. 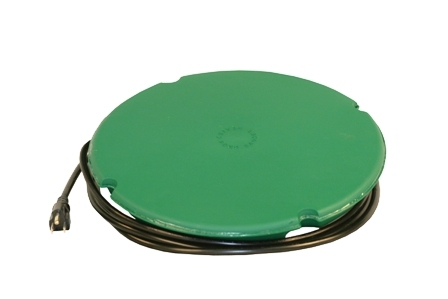 This type of pond heater is easier to install and the submersible type of pond heater can be used to heat quarantine or hospital tanks during spring and summer. How much you can afford to spend on the pond heater and the monthly operational costs. The deicer type of pond heaters usually only work to keep a hole in the ice by warming the water immediately around the deicer / heater and does little to actually heat the rest of the water. To gain the most from your pond heater make sure that you protect your system as much as possible from heat loss. The less heat lost, the lower cost and the more efficient your heating equipment will be. Keeping your water warm in the winter is the best way to keep your koi and goldfish healthy. Even if only at 50 to 52 degrees a submersible pond heater will help keep your fish healthy all winter long. Pond heaters can save countless losses over the winter. Energy efficient, only 200 Watts of Power. Low profile minimizes wind resistance – unnoticed in pond. Thermostatically controlled to operate only when necessary. Fully grounded 10’ supply cord. 1¾” tall x 12” diameter. To view the written AquaDe-Icer Instruction Manual (English & French) in a Down-loadable PDF file that can be printed, click on the link at the end of this statement. When you are finished with the PDF file , click your browser's BACK arrow (located in the upper left corner of your screen) to return to this page. "DOWNLOAD WRITTEN INSTRUCTIONS"
1/24/2013 – I have a small (125 Gallon) pond and would like to know which deicer would be appropriate. 11/23/2009 – my pond is 10tft x 10ft 5f x 1ft 18ooo galons would one heater be ok wich would be best to use thanks i got koi carp mix . . .
10/25/2009 – HI MY NAME IS SHARON , I HAVE SMALL GOLDFISH, MY POND IS ABOUT 350 GALLONS, 4X8X2. DO I NEED TO TURN OFF MY WATERFALL? AND . . .
10/3/2009 – i want a heater to maintain 50 deg f in my 300 gal koi pond so my koi and carp can eat if they want in iowas sub freezing . . .
9/19/2009 – MY pond is about 10ftx4ft and about 700gallons of water. maybe 2 ft deep.I need a heater to deice and warm water, which . . .